Features a lightweight polycarbonate basket that is tough, durable, and built to last. Specially angled tines make scooping easy. Our telescoping model brings hi-tech engineering to the scooping business. 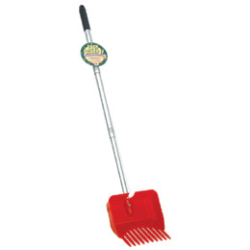 The lightweight aluminum handle adjusts from 42 to 22 inches for efficient merchandising.